Zambia’s 2018 budget was drawn up on the assumption that a deal would be reached with the IMF. The PF regime cannot meet funding and fiscal commitments with existing revenues and may not even be able to pay salaries, Bank of Zambia and ministry of Finance sources told Africa confidential. The Watchdog consistently told these PF goons that Felix Mutati is messing you up deliberately. All along he knew that the IMF wont fund PF, but he kept on cheating Edgar Lungu. The climax however came when there were calls by PF thugs to terminate Mutati’s job as Finance minister. This was at the peak of IMF negotiations. 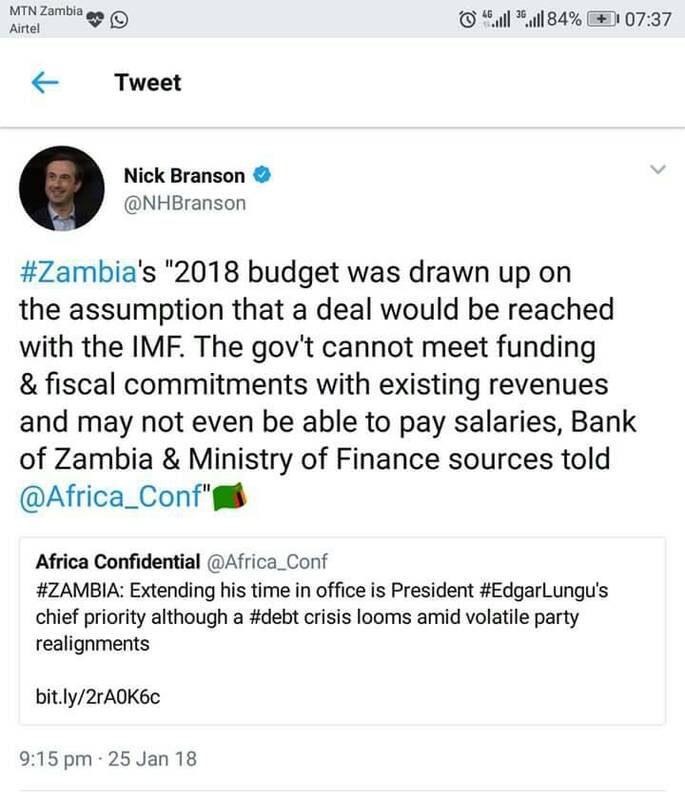 So what Mutati did was simply to tell the IMF (secretly) that Zambia’s external and internal debt is actually 5 times higher than official figures being given. Remember Mutati does not believe in PF. He is MMD and nothing would please him more than seeing PF fail. Remember also what Lucky Mulusa, who was working with Lungu at state house said when he was fired? ‘I have never been a member of PF’? Up to now, Mutati has not joined PF because he does not believe in PF. He is still MMD president. What is the job of the MMD president? Is it to help PF remain in power? No. It is to lead MMD to power at any cost. Is Edgar Lungu an identity fraud?